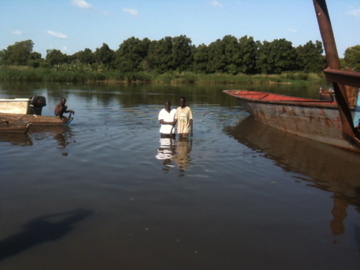 During our second week in Sudan, we were able to witness a baptism in the Nile River. Phillip, one of the students in our doctrines classes, had asked about baptism after one of the lessons on being born again. I wasn't sure initially what he thought about the relationship between baptism and the new birth. But several of us talked about the relationship between those two events, and it became apparent that Phillip is banking on Christ alone for his eternal joy. What a thrill to watch this believer display his identification with Christ publicly for all to see! That week Kevin also became ill, probably with malaria. I was thankful that he had had the foresight to pack the malaria medication and that he was back to teaching his full share of hours within a couple of days. At the customs office on our return to Zambia, the officer took my work permit and other documents, quickly scanned them, and then said something that surprised me, "Welcome home." I was taken aback at first, but what he said rings true with my affection for this place. We are so grateful to God for granting us yet another place on this earth to call home while we continue our pilgrimage toward Christ's kingdom, our final resting place and truest home! After returning from Sudan, Kevin and I jumped right back into classes. I have been pretty busy catching up for the last week and a half, but life is slowly returning back to normal. Next week Jenny, Jamin and I are hoping to get to Lusaka, Zambia's capital, to hurry along the documentation Jamin needs to leave the country. Please pray that we are able to make significant progress on this trip. Thank you for mentioning us in your prayers!